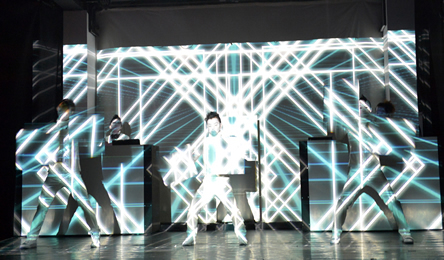 An inspired, fast-paced concoction of light, sound, video projection and movement, generating heady atmosphere with the inspired fusion of all four is what you’re in for with six man Japanese troupe SIRO-A. Their dazzling, must see show crackles with technological wizardry, precision tight, ingeniously choreographed, mechanized performances, driving beats, unrelenting wit and a strong sense of irony, as evidenced by ‘live’ enactments of high powered corporate sports logos, cartoon Hollywood icons, computer games, relentlessly robotic action and driving, pulsating beats, fused with effects inherent to gaming, urbanity and cheerily animated insanity. There’s an underlying understanding throughout that the relevance of the references depicted is as transient as the objects and phenomena themselves, as the show’s now you see it, now you don’t pace mirrors a myriad of multi-era trends, phases and fads. Blend bits of Japan’s Noh Theatre, Chaplin’s Modern Times, cult 50’s Sci-Fi, Kraftwerk, clowns, mime and the biggest, brashest, multi-eraed, most Technicolor clubbing nights of your whole life into a cocktail shaker and you’re sure to taste flavours of indefinable SIRO-A in the resulting mix. Rave meets mall: our digital global community aka consumerist society lampooned and held up for laughter of recognition. Is it real, or is it Memorex? Those old enough to remember television ads of the ‘80’s, and early digital games like Pong will have instant, total recall. Those who’ve kept pace via subsequent leaps into cyberspace or were weaned on screens here, there and who knows where will, likewise, be in synch with SIRO-A’s knowingly topical, kitsch meets techno show. Big Brother, as in Orwell’s 1984 is in the house, and we’re enjoying it, hoping to become super-heroes, cat-walkers, celebrities, voyeurs….‘Are we not men?’, as Devo would talk sing, or are we the numbers society defines us as? Do we derive our identities from gadgets and products? Those themes and more are explored via a glittering, expertly executed, hour of rapid fired vignettes by SIRO - A, which is in itself, something of a Happy Meal with toys, albeit one worth savouring! Is SIRO-A dance, music, lights, cameras, action? Yes, yes, yes, and so much more, within the framework of its fun, but oh so, on the mark, mesmerizingly roller coaster pace. Highlights of this kaleidoscopic video mapped, digitally projected, astoundingly enacted performance, experimental music filled trip are far too legion to mention, as its every second looks, sounds and feels like a vividly encapsulated time warp of the here and now. Moments swiftly pass in succession, aided and enacted by four performers, in the guise of generic faced consumers, somehow, keeping pace with it all, against the current…Futuristically frantic Metropolis meets its’ techno-noir descendent, Bladerunner. Group, dialogue free activity pauses momentarily for intermittent segments focusing on smaller scale scenarios, in one case, the laughably petty misuse of technology to even the score with one’s ex, from Facebook through satellite, enacted by mime and movement artist extraordinaire Toshinori Abe, who exudes oddly delightful silent film star charm, which the audience instantly responds to. Another standout, black and white sequence entitled 'Barcode' finds three white faced, black clothed performers continually trotting back and forth across a small segment of stage, intermittently passing in and out of white sheeted panels at its centre amid endless life-sized projections of themselves, effectively, often, mind bogglingly, blurring lines between reality and optical illusion, something the troupe excels at doing. 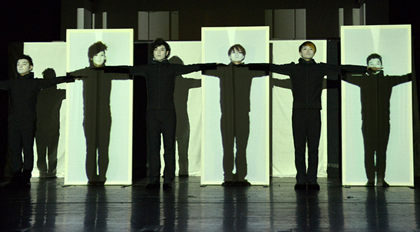 However, each of SIRO-A’s six young male participants, from the show’s integral Sound Creator, Hiroyuki Iwai and its’ equally inventive Visual Artist, Ryosuke Sato go far beyond the bounds of most imaginations, inciting creative possibilities in viewers, who happily clap, cheer, smile and, laugh along. Four man dance troupe Toshinori Abe, Toshiya Arai, Daiki and Yohei enact hitherto unimaginable feats, which really do have to be seen to be appreciated, in conjunction with their furiously scene setting counterparts, DJ/VJ, Iwai and Sato, onstage throughout, synching and evoking shifting effects and atmospheric changes via beats, light and projections. SIRO-A collectively let rip, igniting the show’s fast burning fuse, as it explodes with the excitement of clubbing, drama of theatre, spectacle of circus and unmitigated joy and their delicious mix of all three is elevated to an all time high, fueled by precision timing, grace, agility and boundless imagination. SIRO-A, ten years in the making, is the realization of a dream. By the end of this magical show Director Cocoona and company transform viewers into fluttering, pollinating butterflies.